Fitting your motorhome RV in your garage might not be an option. So where do you park it? It will often be very convenient to park it on your street but is that legal? Yes, a motorhome can be parked on the street in most cases. A motorhome is considered a vehicle and it is licensed and inspected to operate on city streets. How long time you can have it parked on the street will depend on your local city or township ordinances. The rules may also change depending on whether or not you’re sleeping in the vehicle or just parking it there. So let’s proceed and look into how long you can park your motorhome on the street and what other things you might need to pay attention to. Can I Park My Motorhome In a Parking Lot? Where Can I Store My Motorhome? In one of my old neighborhoods, it was not legal to park a vehicle on the street overnight. Parking on the street after midnight would result in a ticket. In certain circumstances, you could apply for a permit that would allow you to park overnight but this did not apply to motorhomes. In this instance, you could park your motorhome on the street during the day but you’d have to find a home for it overnight. The rules on this can change quickly from town to town. There aren’t any states that ban long-term motorhome parking on the street but many cities and localities do. Also, even if your town does not ban motorhomes from being parked on the street for long periods of time, your home owner’s association may. In this case, your HOA could end up filing a lawsuit against you for violating their rules. Also, if you are on a street that does not allow for overnight parking, you’ll end up having to move your motorhome each night regardless of what the rules are on parking motorhomes on the street. In some areas, people are not allowed to park any vehicles on the street. Sometimes this is during certain days or time periods and other times this is permanent. For example, there are city streets that are too narrow to allow for parking at any time. These are usually one-way streets. Parking on one of these streets would block traffic from being able to use the streets. In this case, you certainly wouldn’t be able to park your motorhome there. In other areas, people are not allowed to park any vehicles during a certain time of day or day of the week. These areas usually have street cleaners and you can expect a hefty fine when parking on them during prohibited time periods. I’ve also seen certain city streets that do not allow people to park on them for more than a few hours. For instance, I’ve seen city streets that were not metered but did have time restrictions. The parking authority might walk by and put chalk on your tires to mark when you were last there. They come back again a few hours later when the time period for parking is over. If you’re still there when they come back around, you can expect a fine. RVs are no exception to this rule. In most suburban and rural areas you’ll find that parking on the street temporarily during the day isn’t a problem. This could change, however, if you decide to sleep in the motorhome on one of these streets during the day. Some HOA’s (Homeowners Association), cities, and towns ban people from parking their motorhomes in their driveways. Ironically, other towns and HOAs will only allow people to park their motorhomes in their driveways. For example, there is a town in Pennsylvania that does not allow its residents to park anything in their yard unless it is part of their driveway. In this area, you could have a motorhome, a camper, and even a boat on your property as long as it was on the driveway and not in the yard. Although some towns will ban you from parking your motorhome in your yard and not on your driveway, others will ban you from parking it in the driveway but will allow you to park it in the backyard. Typically this is a rule enacted by the local HOA. Their reasoning is that you’re allowed to park your motorhome on your property as long as they don’t have to look at it. In this case, moving the motorhome to the backyard will suffice. There aren’t any laws against parking a motorhome in a personal garage and even if there were it would be hard to enforce. The issue is usually that a lot of motorhomes are too tall to fit inside of a garage. If you find yourself in this situation, you’ll have five separate options you can take. For people who have motorhomes that are very close to fitting, an option might be to deflate the tires just enough so that the motorhome can be driven through the garage’s opening. Once inside, you’d refill the tires so that they are not sitting in a deflated state. When you wanted to leave the garage again, you’d take the same steps once more. Another option is to dig down to create more space. In this case, you’d lower the ground at the front entrance of the garage. This alteration would take some work but is usually less expensive than other options. The next option is to raise the garage doorway. This would probably involve putting in a new garage door as well. Also, depending on the overall height of your garage you still might not have enough height to drive your motorhome into it. If your current garage can’t be modified to fit your motorhome, you could always build a new garage. Unfortunately, this is cost prohibitive and the same township or HOA that is keeping you from parking your motorhome in the driveway will have to give you permission to build your new garage. If all of this fails, your fifth and final option would be to rent a garage that will fit your motorhome. With a little bit of work, you may find someone on the same street as you that is willing to store your motorhome in their garage for a nominal fee. In many cases, you’ll be allowed to park your motorhome on the street, in your driveway, and in your backyard. An issue arises when you try to sleep in that motorhome overnight. Most towns will let visiting guests park their motorhome in your driveway and even sleep in it for a few nights. Once this becomes a long-term situation, however, this becomes illegal. Parking on residential streets while sleeping in your motorhome is also usually illegal. This is why many travelers like to take a stealthy approach where they pull onto the street late at night and then move their vehicle in the morning. Yes, you can park your motorhome in most parking lots without any trouble. Just be aware that many parking lots have time limits to them so you’ll have to make sure you move along before your time runs out. Also, beware of parking your motorhome in a parking lot overnight. Many places will not allow you to park in their parking lots overnight. This is sometimes restricted by the business and sometimes it is restricted by the local town or city. For example, Walmart would like to allow overnight parking in all of their parking lots. Unfortunately, many cities and towns have passed laws forbidding Walmart from doing so. In some areas, these laws were written in because local residents feared large groups of people would decide to move into their local parking lots. In other areas, these laws were most likely put into place after local campgrounds put pressure on the local government to do so. After all, how can a local campground make money off of travelers when they can just as easily stay for free nearby. Anyplace that stores campers and boats will usually be able to store your motorhome for you. Also, as we mentioned earlier you may be able to store your motorhome at your house or at someone else’s house. Often-times you may find that storing your motorhome at a nearby friend’s home is much more convenient than storing it at an RV storage facility. Parking a motorhome isn’t as simple as some people might wish it to be. Traveling through an unknown town can often lead to tickets and fines. 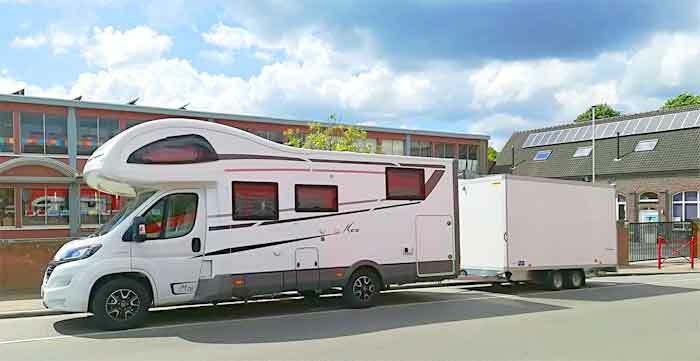 If you plan on buying a motorhome, it’s best to check with your local government as well as your local HOA so that you have a plan for storing your motorhome before you buy.